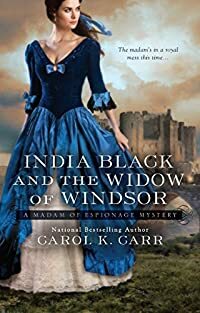 India Black and the Widow of Windsor by Carol K. Carr, a Mysterious Review. Review: India Black is off on another escapade, this time to prevent the assassination of the Queen of the United Kingdom of Great Britain and Ireland and Empress of India — or more simply "Vicky" to those who know her best — in India Black and the Widow of Windsor, the second mystery in this historical series by Carol K. Carr. Following the successful conclusion of a very sensitive incident outlined in the first book in this series, Prime Minister Benjamin Disraeli — "Dizzy" as India comes to think of him — summons India and the enigmatic French (she still doesn't know his first name) and requests they be of assistance once again to the British government and Scotland Yard in preventing a Scottish separatist organization known as the Sons of Arbroath and led by the mysterious Marischal from assassinating Queen Victoria, which it has threatened to do when, following a séance with her long dead husband Prince Albert, she unexpectedly decides to visit her estate at Balmoral for the Christmas holidays. French will pose as an assistant to the Prime Minister, India as one of the household help. It all seems simple enough; what could possibly go wrong? When I had told French that I had to give some thought to disguising myself as a dowdy lady's maid (or God forbid, as the peon who had to empty the chamber pots), I'd meant it. You may think me unpatriotic for not throwing myself in front of the horses to save Victoria Regina, but I had mixed emotions about the whole thing. I mean, Vicky was not what you'd call the cream of the crop when it came to monarchs. There was that unhealthy obsession with her dead husband, for one thing. Long after anyone else would have pulled themselves up by their bootstraps and soldiered on, the Queen was still mooching about Windsor Palace and bemoaning the loss of Albert. This reflection by India on Queen Victoria and the task at hand actually goes on for another three pages or so, and in lesser hands would eventually seem tiresome and trite. Yet here it is effortlessly entertaining and refreshingly frank, and more importantly keeps the reader engaged. There is plenty of derring-do to come, close calls and narrow escapes and more, but it is really accompanying India Black on her adventure and listening, as it were, to her observations on all that goes on that makes this book — and this series — so enjoyable. Acknowledgment: Penguin Group provided a copy of India Black and the Widow of Windsor for this review.